A man was taken into custody Tuesday morning after a standoff involving SWAT and Chicago police officers disrupted service on the Chicago Transit Authority's Green and Pink Line trains for more than four hours. Police said they first got a call just after 2:30 a.m. reporting a man seen sleeping on the elevated "L" tracks above Lake Street near CTA's Morgan Station in the city's West Loop. When officers arrived, they could not get the man to leave, according to police. Fire crews and SWAT units were soon called in and an hours-long negotiation ensued. CTA's Green and Pink line services were suspended to shut off the power on the track as officers worked to resolve the situation safely, police said. After negotiating with the man for nearly 5 hours, SWAT team members were able to coax the man down safely just before 7:30 a.m. 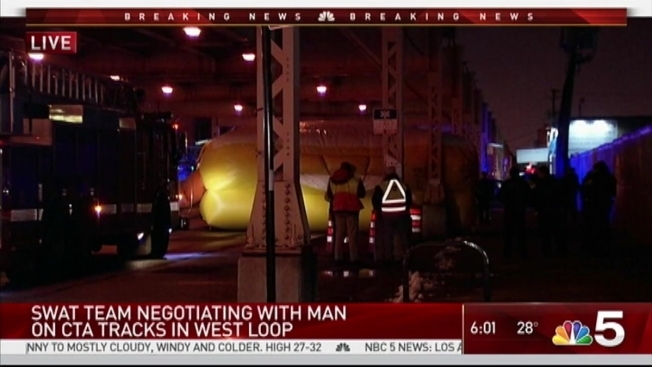 The man's motives for remaining on the tracks is still unclear, CTA officials said.